This 45Mb ISO includes small cd-writer and explorer as shell. Sorry for the quality of this image - didn't noticed it was outputed like this when using the screen capture app, and it may be slower on dial-up connections.. 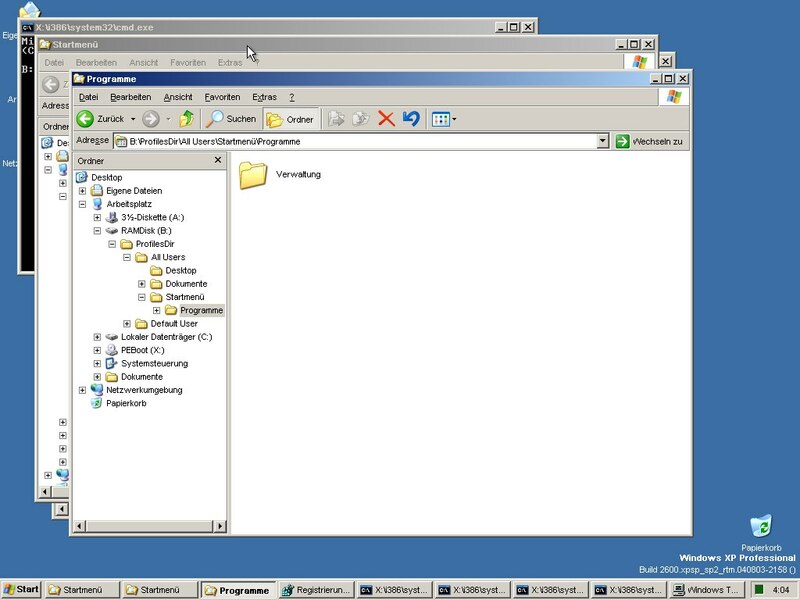 The explorer gives all standard file copy/move/delete operations, and was based on a XP source using the standard project along with Ove's explorer scripts and ramdisk. You now have the ability to pick your Background. I wrote a small script with an additional Autoit3-script which reads the current user settings from HKCU and then writes it to the default-hive. What I experienced: if I use "nu2shell.exe" from BartPE to start the "Explorer" the known resource-problem is also gone here. Or did you not have any resource problems? Normally I can only start 2 to 3 programs the same time. But thanks to Bart these problems are gone (long time yet) in BartPE. So I just used it here and it works like expected as you can see in my snapshot. Thanks for the Screenshots. Hehe! Im using your Misc Settings Script and this is what I get. Resource limit fixed, Refresh not Working fixed, Display Properties Showing, StartUp Showing. I dont get the other tabs from your screenshot. However, the normal network I got so far but I read that somebody also worked on it, otherwise I will work on the script again. I dont think anyone is working on the Networking part for the Standard project yet. Martin 'draugen' Anderse is doing it for the ModPE Project right now. Having Network support for the Standard Project would be Fantastic also. From the screenshot it appears your having success in your testing. Ok, now I have to launch at first and do some 'homework' (cleaning,etc.). Yeah, the normal network 'worked', minimal with "bartpe" (all stuff with licenses will be included) and normal with "PENetCfg". The full-stuff is a little bit more, cause to use the normal network-shell. Just want to inform you that it takes a little more time. 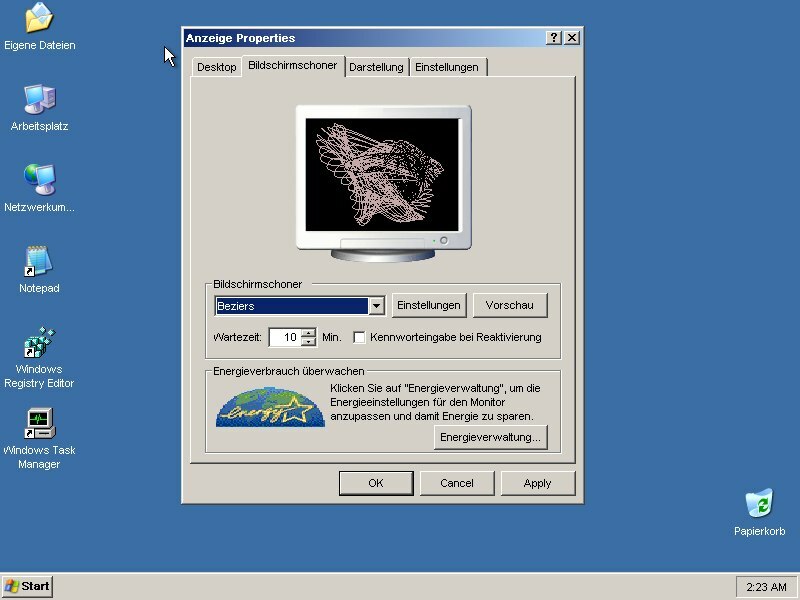 Bart gaves me the info that he cannot allow me to use official the "BartPe.exe" in one of our projects. So don't ask him again to use it here! But I think about a semilar way - I tried already something out to scan for devices. That worked so far - at the moment only with manual steps but worked. And I will a look again to the "snetcfg"-DDK-sample which Bart also gaves credits. What would be nice would be to have a software engineer with ASM and driver development knowledge to take the EXE and reverse-engineer it, then post descriptions of the functions and order for someone to use in creating a new EXE. Reverse engineering is ok and in accordance to most state and federal laws in the US at least. But you have to have the reverse engineers seperate from the new coders. For example, if you or someone analyzes what the EXE does, then someone else needs to take what you know and be able to construct a new program from it. Compaq did this to IBM's bios back in the day and that's why we've got a gazillion IBM-compatible computers nowadays. Microsoft then licensed DOS to all the new companies that started up around being IBM-compatible. What we're doing is a much simpler version of this, but should be possible. It doesn't sound like you're reverse-engineering the binary, though, you're just trying to mimic its function, which is perfectly fine to do. Just a screenshot from my current network project. Some redesign of the GUI was done, also the using of language ini files. A lot of things has to be done...however, no BartPE/PENetcfg are needed anymore! (even if these are very good tools). When its finished so far for testing I will open a new thread under 'Developement'. Icons are looking good, thanks for keeping us updated - keep up the good work!! I can tell you i am very anxious to try it on my usb thumbdrive and i think others too. Didn't had much time this week (also often to tired in the evening to do something).